Russian mlitary jets are leaving Syria. 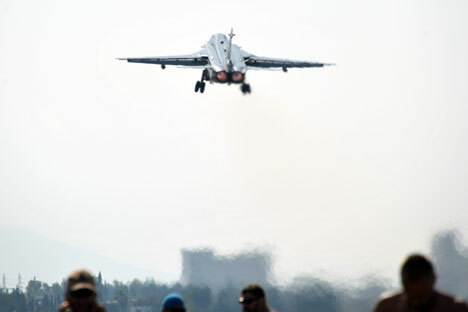 Another group of Russian Aerospace Forces aircraft has departed from the Hmeimim airbase in Syria for bases in Russia, the Defense Ministry press service and information department said. "The group comprises of a 'leader', an Ilyushin Il-76 plane, and Sukhoi Su-25 attack aircraft," the report said. Long-distance flights of Russian planes from the Hmeimim airbase to their bases in Russia are performed in groups. "Every group consists of a 'leader', a military transport plane (either a Tupolev Tu-154 or an Ilyushin Il-76), which airlifts engineers, technicians, and aviation, material and technical property, and various types of Russian warplanes which fly behind it," the report said. The group follows a designated route to the Russian border and, after the border is crossed, every plane independently flies to its base. If necessary, during their flight above Russian territory the planes make stopovers at military airfields for fueling and control of their technical condition, the Defense Ministry said.